Saint Philip, Metropolitan of Moscow, in the world Theodore, was descended from the illustrious noble lineage of the Kolichevi, occupying a prominent place in the Boyar duma at the court of the Moscow sovereigns. He was born in the year 1507. His father, Stephen Ivanovich, "a man enlightened and filled with military spirit," attentively prepared his son for government service. Theodore's pious mother Barbara, who ended her days as a nun with the name Barsanouphia, implanted in the soul of her son a sincere faith and deep piety. Young Theodore Kolichev applied himself diligently to the Holy Scripture and to the writings of the holy Fathers. The Moscow Great Prince Basil III, the father of Ivan the Terrible, brought young Theodore into the court, but he was not attracted to court life. Conscious of its vanity and sinfulness, Theodore all the more deeply immersed himself in the reading of books and visiting the churches of God. Life in Moscow repelled the young ascetic. The young Prince Ivan's sincere devotion to him, promising him a great future in government service, could not deter him from seeking the Heavenly City. On Sunday, June 5, 1537, in church for Divine Liturgy, Theodore felt intensely in his soul the words of the Savior: "No man can serve two masters" (Mt.6:24), which determined his ultimate destiny. Praying fervently to the Moscow wonderworkers, and without bidding farewell to his relatives, he secretly left Moscow in the attire of a peasant, and for a while he hid himself away from the world in the village of Khizna, near Lake Onega, earning his livelihood as a shepherd. His thirst for ascetic deeds led him to the renowned Solovki monastery on the White Sea. There he fulfilled very difficult obediences: he chopped firewood, dug the ground, and worked in the mill. After a year and a half of testing, the igumen Alexis tonsured him, giving him the monastic name Philip and entrusting him in obedience to the Elder Jonah Shamina, a converser with St Alexander of Svir (August 30). Under the guidance of experienced elders Philip grew spiritually, and progressed in fasting and prayer. Igumen Alexis sent him to work at the monastery forge, where St Philip combined the activity of unceasing prayer with his work with a heavy hammer. He was always the first one in church for the services, and was the last to leave. He toiled also in the bakery, where the humble ascetic was comforted with a heavenly sign. In the monastery afterwards they displayed the "Bakery" image of the Mother of God, through which the heavenly Mediatrix bestowed Her blessing upon the humble baker Philip. With the blessing of the igumen, St Philip spent a certain while in wilderness solitude, attending to himself and to God. In 1546 at Novgorod the Great, Archbishop Theodosius made Philip igumen of the Solovki monastery. The new igumen strove with all his might to exalt the spiritual significance of the monastery and its founders, Sts Sabbatius and Zosimus of Solovki (September 27, April 17). 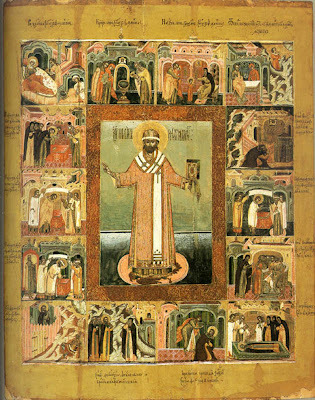 He searched for the Hodigitria icon of the Mother of God brought to the island by the first head of Solovki, St Sabbatius. He located the stone cross which once stood before the saint's cell. The Psalter belonging to St Zosimus (+1478), the first igumen of Solovki, was also found. His robe, in which igumens would vest during the service on the days when St Zosimus was commemorated, was also discovered. The monastery experienced a spiritual revival. A new monastic Rule was adopted to regulate life at the monastery. St Philip built majestic temples: a church of the Dormition of the Mother of God, consecrated in the year 1557, and a church of the Transfiguration of the Lord. The igumen himself worked as a simple laborer, helping to build the walls of the Transfiguration church. Beneath the north portico he dug himself a grave beside that of his guide, the Elder Jonah. Spiritual life in these years flourished at the monastery: struggling with the brethren with the disciples of Igumen Philip were Sts John and Longinus of Yarenga (July 3) and Bassian and Jonah of Pertominsk (July 12). St Philip often withdrew to a desolate wilderness spot for quiet prayer, two versts from the monastery, which was later known as the Philippov wilderness. But the Lord was preparing the saint for other work. In Moscow, Tsar Ivan the Terrible fondly remembered the Solovki hermit from his childhood. The Tsar hoped to find in St Philip a true companion, confessor and counsellor, who in his exalted monastic life had nothing in common with the sedition of the nobles. The Metropolitan of Moscow, in Ivan's opinion, ought to have a certain spiritual meekness to quell the treachery and malice within the Boyar soul. The choice of St Philip as archpastor of the Russian Church seemed to him the best possible. For a long time the saint refused to assume the great burden of the primacy of the Russian Church. He did not sense any spiritual affinity with Ivan. He attempted to get the Tsar to abolish the Oprichniki [secret police]. Ivan the Terrible attempted to argue its civil necessity. Finally, the dread Tsar and the holy Metropolitan came to an agreement: St Philip would not meddle in the affairs of the Oprichniki and the running of the government, he would not resign as Metropolitan in case the Tsar could not fulfill his wishes, and that he would be a support and counsellor of the Tsar, just as former Metropolitans supported the Moscow sovereigns. On July 25, 1566 St Philip was consecrated for the cathedra of Moscow's hierarch saints, whose number he was soon to join. Every aspect of governmental service, all the measures undertaken to restructure civil and social life, Ivan the Terrible tried to rationalize as a manifestation of Divine Providence, as God acting in history. His beloved spiritual heroes were St Michael of Chernigov (September 20) and St Theodore the Black (September 19), military men active with complex contradictory destinies, moving toward their ends through whatever the obstacles before them, and fulfilling their duties to the nation and to the Church. The more the darkness thickened around Ivan, the more resolutely he demanded cleansing and redemption of his soul. Journeying on pilgrimage to the St Cyril of White Lake monastery, he declared his wish to become a monk to the igumen and the brethren. The haughty autocrat fell on his knees before the igumen, who blessed his intent. Ivan wrote, "it seems to me, an accursed sinner, that I am already robed in black." Ivan imagined the Oprichnina in the form of a monastic brotherhood, serving God with weapons and military deeds. The Oprichniki were required to dress in monastic garb and attend long and tiring church services, lasting from 4 to 10 o'clock in the morning. "Brethren" not in church at 4 o'clock in the morning, were given a penance by the Tsar. Ivan and his sons fervently wished to pray and sing in the church choir. From church they went to the trapeza, and while the Oprichniki ate, the Tsar stood beside them. The Oprichniki gathered leftover food from the table and distributed it to the poor at the doorway of the trapeza. Ivan, with tears of repentance and wanting to be an esteemer of the holy ascetics, the teachers of repentance, he wanted to wash and burn away his own sins and those of his companions, cherishing the assurance that even his terribly cruel actions would prove to be for the welfare of Russia and the triumph of Orthodoxy. 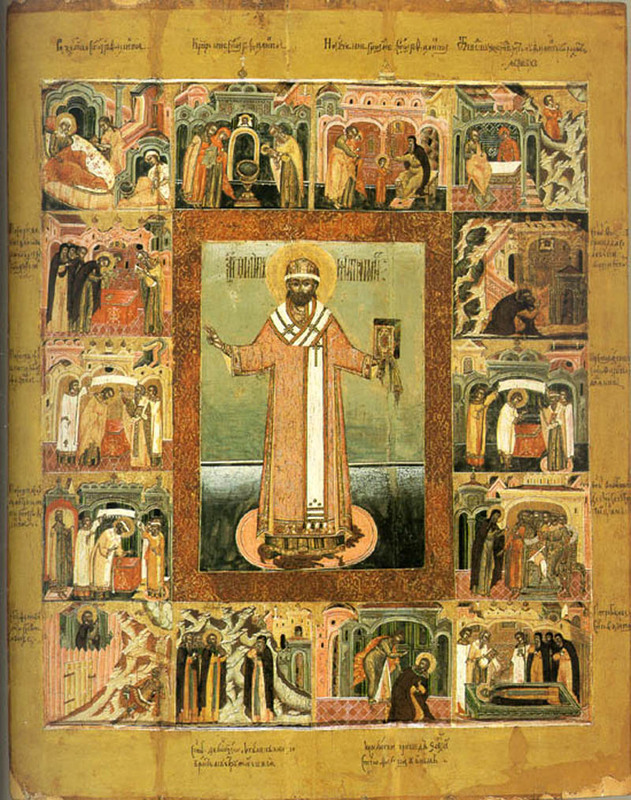 The most clearly spiritual action and monastic sobriety of Ivan the Terrible is revealed in his "Synodikon." Shortly before his death, he ordered full lists compiled of the people murdered by him and his Oprichniki. These were then distributed to all the Russian monasteries. Ivan acknowledged all his sins against the nation, and besought the holy monks to pray to God for the forgiveness of his tormented soul. The pseudo-monasticism of Ivan the Terrible, a dark most grievous oppression over Russia, tormented St Philip, who considered it impossible to mix the earthly and the heavenly, serving the Cross and serving the sword. St Philip saw how much unrepentant malice and envy was concealed beneath the black cowls of the Oprichniki. There were outright murderers among them, hardened in lawless bloodletting, and profiteers seeking gain, rooted in sin and transgressions. By the sufferance of God, history is often made by the hands of the impious, and Ivan the Terrible wanted to whiten his black brotherhood before God. The blood spilled by its thugs and fanatics cried out to Heaven. St Philip decided to oppose Ivan. This was prompted by a new wave of executions in the years 1567-1568. In the autumn of 1567, just as the Tsar was setting out on a campaign against Livonia, he learned about a boyar conspiracy. The plotters intended to seize the Tsar and deliver him to the Polish king, who already was on the move with an army towards Russian territory. Ivan dealt severely with the conspirators, and again he shed much blood. It was bitter for St Philip, and the conscience of the saint compelled him boldly to enter into defense of the executed. The final rift occurred in the spring of 1568. On the Sunday of the Veneration of the Cross, March 2, 1568, when the Tsar with his Oprichniki entered the Dormition cathedral in monastic garb, as was their custom, St Philip refused to bless him, and began openly to denounce the lawless acts committed by the Oprichniki. The accusations of the hierarch shattered the harmony of the church service. In a rage Ivan retorted, "Would you oppose us? We shall see your firmness! I have been too soft on you." The Tsar began to show ever greater cruelty in persecuting all those who opposed him. Executions followed one after the other. The fate of the saintly confessor was sealed. But Ivan wanted to preserve a semblance of canonical propriety. The Boyar Duma obediently carried out his decision to place the Primate of the Russian Church on trial. A cathedral court was set up to try Metropolitan Philip in the presence of a diminished Boyar Duma, and false witnesses were found. To the deep sorrow of the saint, these were monks of the Solovki monastery, his former disciples and novices whom he loved. They accused St Philip of a multitude of transgressions, including sorcery. "Like all my ancestors," the saint declared, "I came into this world prepared to suffer for truth." Having refuted all the accusations, the holy sufferer attempted to halt the trial by volunteering to resign his office. His resignation was not accepted, however, and new abuse awaited the martyr. 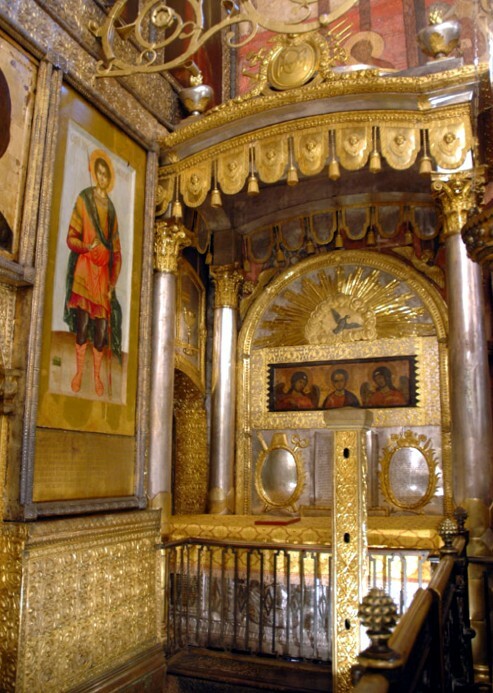 Even after a sentence of life imprisonment had been handed down, they compelled St Philip to serve Liturgy in the Dormition cathedral. This was on November 8, 1568. In the middle of the service, the Oprichniki burst into the temple, they publicly read the council's sentence of condemnation, and then abused the saint. Tearing his vestments off, they dressed him in rags, dragged him out of the church and drove him off to the Theophany monastery on a simple peasant's sledge. Initially, the memory of St Philip was celebrated by the Russian Church on December 23, the day of his martyric death. In 1660, the celebration was transferred to January 9. His memory in all is celebrated three times a year: His main feast day falls on January 9. The feast of the translation of his relics is celebrated on July 3. On October 5 he is celebrated as one of the Hierarchs of Moscow. The celebration of a special day (Synaxis) to honor Saints Peter, Alexis, and Jonah as "Metropolitans and Wonderworkers of All Russia" was established by Patriarch Job in 1596. In 1875, St. Innocent, Metropolitan of Moscow proposed that St. Philip be included with the others. O successor of first prelates, pillar of Orthodoxy, champion of truth, new confessor, Saint Philip, thou didst lay down thy life for thy flock. Wherefore, since thou hast boldness with Christ, pray for the suffering Russian land and them that worthily honour thy holy memory. Let us praise most wise Philip, guide and teacher of Orthodoxy, herald of truth, emulator of Chrysostom, lamp of Russia, who fed his children spiritually with the food of his words; for by chanting praise with his tongue, he taught us to chant with our lips as an initiate of the grace of God.